With the Swift Optical binocular M3-B, you can observe everything from butterfly wings to plant cell walls at 20 to 400 times their actual size, with remarkably clear images at every magnification level. The versatile M3-B allows everyone - professionals, educators and students - to observe an incredibly wide range of specimens. 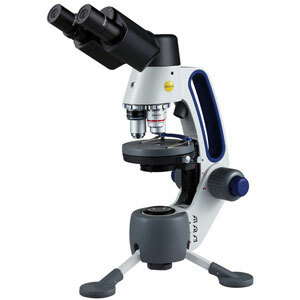 In traditional microscope mode, the standard biological micro magnifications of 4X, 10X, & 40XR combined with bottom LED illumination, allow users to view on slides specimens like protozoans, blood cells and other microscopic samples. When you're ready to head into the field, you'll find the M3-B's sturdy tripod legs perfectly suited to the task. And its rechargeable illumination system allows for up to 40 hours of use on an eight-hour charge. In macroscope mode, the 2X magnification macro setting with top illumination is perfect for viewing opaque objects such as rocks, plants and insects. The M3-B is built to last with all-metal internal parts and glass optics. It features a 0.65 Iris Condenser, with protective Iris Shield, plus DIN Standard Achromat Objective Lenses and energy efficient, bright white light that emits virtually no heat. The ergonomic carrying handle makes the M3-B easily transportable. It also comes packaged with several free accessories including a Super Slide Kit with prepared slides, extra blank slides, and cover slips. Illuminator Top & bottom, white LED with variable intensity control.